Help Kids Learn About Bullying. Help Stop Bullying! October is Anti-Bullying Month! This topic is appropriate year-round and for all ages. 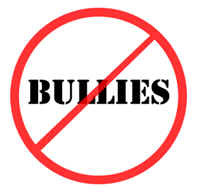 Visit this site to guide your children through videos and activities explaining bullying. It is never too early to explain this. It happens in kindergarten too. Help your child recognize the behavior and learn to help those being bullied.